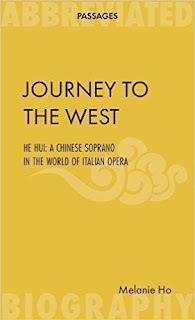 Journey to the West: He Hui, a Chinese soprano in the world of Italian opera, by Hong Kong-based author and journalist Melanie Ho, is the first biography of China's first prima donna - arguably the most successful Western opera singer to come out of China. Soprano He Hui has made some of the biggest roles in Italian opera her own, including the title role in Madam Butterfly. Her story is one of East meeting West, and of East and West living alongside each other. It begins in her hometown of Xi’an, China, and moves on to Verona, her adopted Italian home. Along the way to stardom He Hui overcomes challenges, and rejection. Melanie Ho here offers a brief overview of He Hui's journey. This month, the Chinese soprano He Hui has been on stage at the Metropolitan Opera in New York, performing Madam Butterfly, one of her signature roles. In this run of Puccini’s East-meets-West masterpiece, He Hui has been praised by the Huffington Post for running “Cio-cio-san’s emotional gamut with agility” and for having “a soaring, passionate voice.” A year after she made her debut in the role in 2003, the Wiener Zeitung called her performance at the Volksoper in Vienna “the best Butterfly you could wish for”. Butterfly, along with Puccini’s Tosca and Verdi’s Aida, which she performed in Hong Kong in October, are considered He Hui’s three signature roles - she has transformed herself into the tragic Cio-cio-san and the Ethiopian princess Aida more than 150 times, and has played the Italian opera diva Floria Tosca in close to 100 performances. Next year she celebrates 20 years singing at some of the world’s most prestigious opera houses, making her arguably the most successful Western opera singer to come out of China. He Hui’s story begins not in her adopted home of Verona, where she has now lived for more than 15 years, but in Xi’an, where, at age 18, she began to study singing for the first time at the prestigious Conservatory of Music. It was there where, shortly after she began her studies, she heard her first opera - a recording of Mirella Freni singing Puccini’s La Boheme. Despite not understanding Italian or the tragic story of impoverished artists in Paris, the emotion of the opera, of Freni’s voice and of Puccini’s music brought her to tears. The pull was so strong that He Hui knew she wanted to be an opera singer. There’s a line in Butterfly about fate: Cio-cio-san says: “io seguo il mio destino” (“I follow my destiny”). When He Hui speaks about how opera first moved her - how it still moves her - she often uses the phrase “una grande emozione” and she almost chokes up as though her decision to be a soprano wasn’t entirely her own. Recently she was asked why she was known as being a “Verdi soprano”, so-called because her lirico-spinto voice - rich from the bottom to the top and one that fills the hall - is well-suited to Verdi. Her reply was simple: she didn’t have a say in the matter; this is the voice she has. But saying it is destino omits He Hui’s hard work. She was at the top of her class in the Conservatory and shortly after finishing second in Placido Domingo’ Operalia competition in 2000, she performed a concert in Shanghai with Domingo. By April 2001, she had moved to Verona, where her agent was based. There she began a series of unsuccessful auditions including at opera houses in Bologna, Florence, Genoa, and Rome. Her audition for Gian Piero Rubiconi, the artistic director of the Teatro Regio di Parma, was different. Rubiconi asked for just a single piece, “Vissi d’arte” (“I have given my life to art”), Tosca’s Act II aria. Scarpia has suggested to Floria Tosca that he would release her lover Cavaradossi from prison if she were to give herself to him. As she realises that her personas of Tosca the diva, and Floria Tosca the person, cannot be kept separate, she calls on God, asking him what He has subjected her to. “Vissi d’arte” is one of the most popular arias for the lirico-spinto, a true show-stopper - the opera literally draws to a halt - and one of opera’s most captivating moments: all eyes are on the soprano. At the audition, all eyes were on He Hui. When Rubiconi made his request, He Hui replied that she could sing the aria, but she hadn’t come with it prepared. He urged her to sing it all the same and so she stood on stage, her fate and Tosca’s weaving together. “Ah, perché me ne rimuneri così?” (“Why do You reward me thus?”). She finished and stepped off the stage, catching her agent’s eyes. They were red. He Hui left the room, leaving the two to discuss her fate. When her agent emerged, it was to inform her she had won her debut as Floria Tosca, to be performed at the Teatro Regio in February of the following year. For that debut role, He Hui was mentored by Raina Kabaivanska, the Bulgarian lirico-spinto soprano renowned as one of the world’s best Toscas. Kabaivanska offered He Hui a piece of advice that would prove pivotal to her career: “È urgente studiare italiano,” (“It is urgent to study Italian”). He Hui heeded the advice and began studying Italian, not formally with a tutor or by taking a course, but by living in Verona. The result is that she has an italianità that is accepted by Italian audiences. Opera is considered a national product by Italians and if foreigners don’t master the diction or haven’t sufficient knowledge or feeling of the genre’s history and dramaturgy, they aren’t accepted. If He Hui is Butterfly because she understands what it means to be a young Asian woman with hopes and aspirations for a life outside of her traditions, she is also Tosca; she is as much a celebrated singer as she is an Asian woman—her italianità is as believable in Puccini’s Tosca as is the Asianness she exudes in Butterfly. He Hui’s connection with Butterfly is there for all to see, but her connection to Tosca - she becomes Tosca - is perhaps less immediately self-evident. 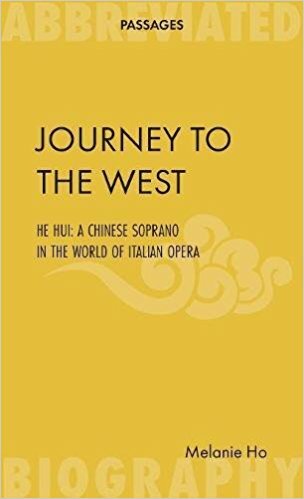 Perhaps this makes it all the more extraordinary: her Italian comes from living, breathing and singing in her adopted home, the country of opera’s origins and the destination of He Hui’s own journey west. Details: Journey to the West is published in paperback by Abbreviated Press, priced in local currencies.